KnR Projects uses brick machine on mobile trailer to manufacture various bricks and blocks at the location of the clients' choice. All what the cliet will do is to send an enquiry to KnR and we will call back at the earliest of our convinience. We will source affordable raw materials and we will supply the brick and block on site and resume the manufacture the products forthwith. Solid Brick- and Block yard consists essentially of a means of moulding solid brick and block, a concrete mixer, and general- purpose tools and equipment. The equipment are discussed below. 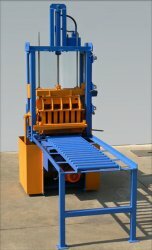 KnR Projects uses stationary machinethat mould solid brick and blocks, one or more at a time, on pallets. KnR Projects use pan mixers for manufacturing of solid brick and block, with a forced mixing action, can cope with the semi-dry mixes used for making solid brick and blocks-. A mixer of adequate capacity for making hollow units may have insufficient capacity for solid units. It includes wheel-barrows, batching equipment, trolleys, shovels, hose-pipes and plastic sheeting. KnR Projects uses cement that complies with SANS 50197-1. KnR Projects uses strength class of 42,5N or higher because the concrete must develop strength as rapidly as possible, for high quality solid bricks and blocks. Aggregate sand and stone are used for solid brick and block production. KnR Projects uses water that is suitable for solid brick and block manufacturing. KnR Projects may collect suitable river and borehole water for the production of solid bricks and blocks. KnR Projects uses affordable mixes to produce blocks that have an acceptable texture and are strong enough yet affordable. Cement is the most expensive element compared to the aggregates, the lower the correct ratios of aggregate to cement content the affordable is the product. KnR Projects will use 6:1, 8:1 and 10:1 by loose volumes, respectively (230, 300 and 380 - of aggregate respectively per 50 - kg bag of cement). Brick and block density is a good indicator of strength, bricks and blocks can be assessed by weighing them as soon as they are out of the mould. Therefore, adjust the mix until the heaviest brick and block is achieved. The National Building Regulations require nominal strengths of 7 – Mega pascal (MPa) for solid brick and 3,5 – (MPa) for hollow block for single storey houses and buildings. Water content and moisture are catalyst in the manufacturing of solid brick and block. The mixture must be wet enough to bind together when compacted. The moisture content should be as high as possible as this allows better compaction and thus gives the best strength. The day after production, solid bricks and blocks should be removed from the production slab or pallets and stored in the brickyard, ready for curing. Stacks should be carefully built to avoid chipping edges and corners. Curing is the process of maintaining a satisfactory moisture content and a favourable temperature in the blocks to ensure hydration of the cement and development of optimum strength. In the South African climate it is normally sufficient to cover solid brick and blocks with plastic sheeting to prevent moisture loss or to spray solid brick and blocks with water. The solid brick and block should be cured for at least seven days to produce strength of 7 MPa and 3.5 MPa, respectively.